JONES, AUGUSTUS, surveyor, land speculator, farmer, and militia officer; b. 1757 or 1758 in the Hudson River valley, N.Y., son of Ebenezar Jones; d. 16 Nov. 1836 near Paris, Upper Canada. Augustus Jones’s grandfather immigrated from Wales to North America before the American revolution. The family settled on the Hudson River, probably in Dutchess County, N.Y., and then in the vicinity of Newburgh, where Augustus, who had trained as a surveyor in New York City, figured in land transfers in 1783–84. Accompanied or followed by his father and several of his brothers and sisters, he later moved to the new loyalist settlements on the Niagara peninsula, locating initially in Saltfleet Township. On 9 June 1787 he presented to the commanding officer at Fort Niagara (near Youngstown, N.Y.), Major Archibald Campbell, an introductory letter from Cadwallader Colden, son of a former lieutenant governor of New York and a prominent loyalist. The letter, Augustus later recollected, attested to his “good moral, and loyal character” and to his surveying abilities. Sworn in as a crown surveyor on the 11th, he began working with various survey parties. In January 1788 the commanding officer of the upper posts, Captain Jonas Watson, made him an assistant to Philip Frey, the deputy surveyor for the Nassau District. Jones served as acting deputy surveyor from November of the following year to early in 1791, when, on instruction from Deputy Surveyor General John Collins* at Quebec, he officially replaced Frey, who had left the province. The ambitious Jones intended to build up large personal landholdings in Upper Canada similar to those of the great New York landholders such as the Coldens. Through the system of petition and grant, he acquired extensive lands in Saltfleet and Barton townships during the 1790s, in addition to town lots in Newark (Niagara-on-the-Lake) and York (Toronto). 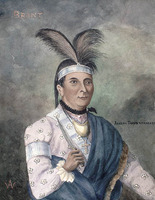 In 1797 and 1805 he received from the Mohawk war chief Joseph Brant [Thayendanegea*], reputedly in payment for surveys on the Grand River, two leases of land there which together comprised roughly ten square miles. In 1801 Jones unsuccessfully attempted to secure from the government an even larger tract in return for constructing a road from York to the Head of the Lake (the vicinity of present-day Hamilton Harbour) . Employing Indians in his survey parties, Jones came to know both the Mohawk and the Mississauga Ojibwa peoples, whose languages he learned. A number of Indians came to trust him. When the Ojibwas momentarily contemplated rebellion against the British in 1797 after a Queen’s Ranger had murdered Wabakinine*, head chief of the Mississaugas at the western end of Lake Ontario, they made Jones a party to their plans, asking if he would join them. Instead, he immediately notified the province’s administrator, Peter Russell*, of the situation. Joseph Brant employed him on many surveys on the Grand River. The two men, who lived at opposite ends of Burlington Beach, became close friends. In addition to leasing him land on the Grand, Brant made Jones his agent on occasion, in land purchases among other matters, and named him one of his executors. A number of the Iroquois who opposed Brant’s policy of leasing out their reserve lands to whites refused to accept the validity of Brant’s two leases to Jones. 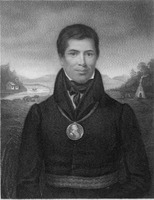 Jones established family ties with both the Mohawks and the Mississaugas. On 27 April 1798 the surveyor, then in his early 40s, married Sarah Tekarihogen (Tekerehogen), 18-year-old daughter of Tekarihogen*, a Mohawk chief. Eventually eight children were born to them. Simultaneously, at least in the early years of this marriage, Jones maintained a previous relationship with a young Mississauga woman, Tuhbenahneequay (Sarah Henry), the daughter of Wahbanosay, a Mississauga chief. Together they had at least two sons, Thayendanegea [John] born in 1798 and named after Brant, and Kahkewaquonaby [Peter*], born in 1802. 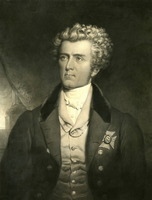 Jones’s full-time work for the government ceased for unknown reasons in 1800. Possibly he decided to retire to his farm in Saltfleet Township and to undertake less strenuous work than surveying. Perhaps the Executive Council let him go: it may have feared his close ties with Brant, who, as the leading native spokesman in Upper Canada, had frequently clashed with the authorities. 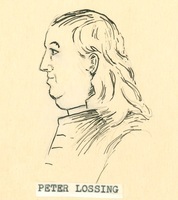 Possibly doubts about his family’s alleged loyalty in the American revolution had reached government circles at this time. Definitely one of his brothers-in-law, James Gage, had fought for the Americans. Also, it appears from a pension application submitted to the American government in 1855 by the widow of his brother Ebenezar that Ebenezar had served with the American forces. Certainly the violent tone in which Lieutenant Governor Sir Francis Bond Head* referred in 1836 to Augustus as “an American surveyor” who “in open adultery had children by several Indian squaws” infers that the government doubted his family’s loyalist status; it definitely questioned his morality. After his departure from government service in 1800, Jones farmed for some 17 years with Ebenezar and their nephew James Gage* as his immediate neighbours. The retired surveyor became a prominent settler in the area, serving as a militia captain from 1794 to 1811. Around 1801 Augustus and Sarah Jones joined the Methodist Episcopal Church. The Reverend Nathan Bangs* remembered Jones’s Mohawk wife as “a very amiable and interesting woman.” Sarah, another contemporary reported, “though retaining Indian costume presided at the table with a taste equal to a refined lady’s.” At the same time she imparted much of her Indian way of life to her children, teaching her daughter Catharine about herbs and their proper uses. In his Life and journals, Peter, who with his brother John had been raised by their natural mother, wrote that his father endeavoured “to instill moral principles into the minds of his children” and tried, with limited success, to prevent them from working or hunting on the Sabbath. In 1817 Jones and his family, including Peter, left Saltfleet for the Mohawk Village (Brantford) and his wife’s people on the Grand River. Personal financial loss, and perhaps the prejudice of white neighbours against his Indian family, best explain his decision. During the War of 1812 damage worth more than £250 had been done to his farm. On 27 May 1815 arsonists burned his barn. For several years Jones farmed on the plains bordering on the Grand, and then, in his 70s, he moved north to Cold Springs, his tract of 1,200 acres on Dundas Street, east of Paris. He supported his family by farming and by selling off portions of his vast estates. Energetic to the end, he died in 1836 before he could erect the mill he intended to build at his constantly bubbling spring. To complement the mill, the old surveyor had planned to lay out the land around it in town lots. No actual physical description of Jones has survived. One quickly acquires a sharp image of him, however, from reading his survey diaries and personal correspondence. A physically strong and ambitious man, whose wives and best friends were Indians, he lived in two worlds simultaneously and, particularly in his first years in Upper Canada, served as a bridge between them. AO, MU 4756, no.6 (photocopy); RG 1, A-I-1, 32: 1, 25; A-I-6: 2723–24, 2729–32; C-I-9, 2: 57; CB-1, boxes 29, 40. PAC, RG 1, L3, 260: J20/15; 261a: J22/1, 3; RG 10, D3, 103–4, 108. PRO, CO 42/439: 271. Victoria Univ. Library (Toronto), Peter Jones coll., Eliza[beth Field] Jones Carey papers, diary, 26 Aug., 13 Sept. 1834. Nathan Bangs, An authentic history of the missions under the care of the Missionary Society of the Methodist Episcopal Church (New York, 1832), 183. Corr. of Hon. Peter Russell (Cruikshank and Hunter), 1: 50; 2: 261. Corr. of Lieut. Governor Simcoe (Cruikshank), 1: 24. “District of Nassau: minutes and correspondence of the land board,” AO Report, 1905: 300, 303, 309, 319–20, 327. John Askin papers (Quaife), 2: 311, 320, 325. Peter Jones, Life and journals of Kah-ke-wa-quo-nã-by (Rev. Peter Jones), Wesleyan missionary, [ed. Elizabeth Field and Enoch Wood] (Toronto, 1860). “Records of Niagara, 1805–1811,” ed. E. A. Cruikshank, Niagara Hist. Soc., [Pub. ], no.42 (1931): 117. Valley of Six Nations (Johnston). Upper Canada Gazette, 10 July 1794, 22 July 1815, 3 June 1824. DHB. M. F. Campbell, A mountain and a city: the story of Hamilton (Toronto and Montreal, 1966), 22. Johnston, Head of the Lake (1958). “Augustus Jones,” Assoc. of Ont. Land Surveyors, Annual report (Toronto), 1923: 112–21. Elizabeth [Field] Carey, “Mrs. Sarah Jones, Mohawk,” Christian Guardian, 13 March 1861. Grant Karcich, “Augustus Jones, Upper Canada public land surveyor,” Families (Toronto), 22 (1983): 321–26. Donald B. Smith, “JONES, AUGUSTUS,” in Dictionary of Canadian Biography, vol. 7, University of Toronto/Université Laval, 2003–, accessed April 20, 2019, http://www.biographi.ca/en/bio/jones_augustus_7E.html.